The Roswell New Mexico UFO mystery remains to be one of the most legendary on all of UFO lore. The incident allegedly occurred on July 8, 1947 in the deserts of Roswell, New Mexico. An object did crash in the desert and it was recovered by the military...and with good reason. The US was in the early stages of the Cold War and only 2 years removed from the use of the Atomic Bomb during World War II. The official story that the military has put forth is that a top secret US based weather balloon known as "Mogul" and needed to recover it as soon as possible. Some believe that it may very well have been a Soviet spy device that crashed but this has never been proven even with the declassification of old KGB files. Then, there was a news reportthat was published in the local newspaper at the time. 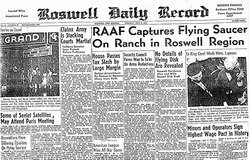 The Roswell Daily Record opted to publish a front page story of a "flying saucer" captured by the Air Force. Under the headlines was a very telling fact: "No details of flying disk revealed." If there were no details revealed, how could the Roswell New Mexico UFO incident truly be a UFO conspiracy? The reason is that sightings of UFOs were starting to become ‘common' in the 1940s - another aftermath of the Cold War and Atomic Bomb influence. So, the use of the word ‘flying saucer' in the news report was more of a colloquialism. In fact, the story was not really reported upon much until the late 1970s when salacious documentaries, books, and motion pictures started to promote the notion of a UFO conspiracy. This is not to say that the tale of an alien being recovered in the crash started in the 1970s. It had been an urban legend for many years. The entertainment mediums picked up on the Roswell New Mexico UFO stories of conspiracy and government cover ups. It made such a unique tale that it captured the public's attention and imagination. In time, the tale of a cover actually continued to expand until the notorious (and dubious) alien autopsy footage emerged in the late 1990s. Yes, the legend keeps growing because it has long since taken on a life of its own. And the military base in Roswell is a top secret installation so it will certainly not be releasing any files on their operations within it. This further allows the myth to continually perpetuate. In some ways, this is a good thing because the addition of UFO conspiracy theories does add a little unique folklore to American history. Today, the Roswell New Mexico UFO mystery is still considered to be one of the world’s greatest unsolved mysteries.